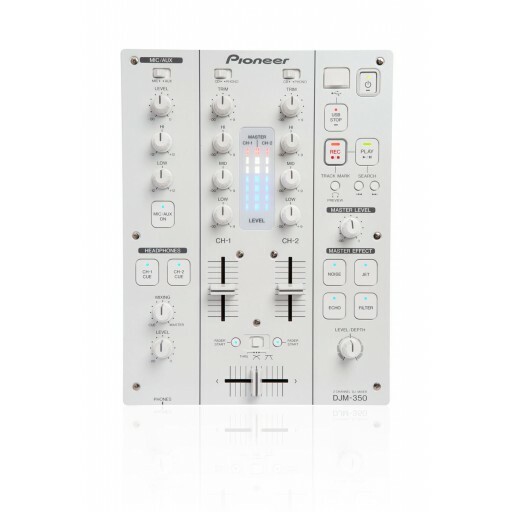 The DJM-350 mixer inherits similar functions and operability of the popular Pioneer DJM series of mixers often experienced in the club scene. The mixer is equipped with four kinds of effects as well as an isolated 3-band equalizer—all of which allow the DJ to make a one-of-a-kind mix. The front USB port allows users to record their DJ mixes onto USB storage devices, check their own mix and take it with them to listen on other devices. Directly Record to USB Devices – Users can conveniently record their DJ mixes directly to a USB storage device via a USB port (Type A) located on the face of the mixer without having to use a computer or recording device. Recorded DJ mixes are saved as WAV files, allowing them to be imported for playback on a PC or other portable audio players. Isolated 3-Band Equalizer - The mixer features a built-in 3-band equalizer (isolator1 type) that allows a broad range of independent level control, from +9dB to -∞ (cut) in each of the HI, MID & LOW ranges. Digital Conversion - Analog signals are converted into digital form via high-performance CPU for higher fidelity sound. In addition, analog and digital circuits are isolated to minimize induced noise.